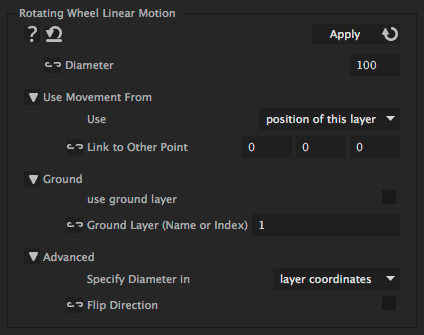 This iExpression computes the rotation of a wheel based on the movement of the layer. This can be used to rotate the wheels or a car or any other kinds of wheels that roll on the ground. This iExpression has the following limitations: (a) the wheel may only move along a straight line (for example horizontally, but any other direction is also possible). On this line it may move both forwards and backwards. (b) the size of the wheel may not change over time. If you have more complex animations where either (a) or (b) is not satisfied, use the iExpression "Rotating Wheel Curvaceous Motion" that can handle these cases but computes a bit slower.